Before we’ve even left Gdansk Glowny. Kasienka and her mother arrive in England, with only the postmark on a letter as a clue as to where her father is they are on a search. But Kasienka’s mother is heartbroken, and school is a nightmare, so when Kasienka meets William at the pool one day and he suggests she joins the school swim team she’s over the moon. She tells her mama but her chance is knocked away, her mother needs her more than she needs the swim team it would seem. Can Kasienka manage to help her mama, find her Tata, get to know William and make the swim team or is it all too much for a 13 year old to bear. I love, love, love books written in verse. They are often so beautiful and tell a story really uniquely, and The Weight of Water is no different. I think it really helped the story because the break ups in the lines kind of reflected how Kasienka probably spoke, she is polish and can speak English but it’s slightly broken. I really thought that the way the whole book was written reflected this in a way and I couldn’t get enough of it. The story really shows how much one thing can change a person’s life. Kasienka’s Tata had left her and her Mama in Poland to make his way to England. This changed her life dramatically as her Mama refuses to let go and drags Kasienka to England too. There a series of events makes Kasienka wish for home and to be honest, I would want to as well. I love how the story shows how different people can act in different ways because of events as well and how sometimes you have to take other peoples considerations before your own. Kasienka does a lot of growing up and learns a lot about people when she is thrust into a foreign country with no friends to speak of, but she handles it so well I think! The characters in this story were actually put across really well, sometimes I think the verse novels can lose a bit of the characters because they are slightly limited but even though you weren’t aware of what any of them really looked like, other than Kanoro, their personalities shone through. I honestly thought Kasienka’s Mama was so, so selfish, even though she was hurting she took it all out on Kasienka and I wanted her to realise what she was doing half the time. But she was balanced out with Kanoro; he was a brilliant character, so loving and helpful to Kasienka when she needed him the most. I wanted him to help her mother realise what a horrible person she was being and in a way he did. Then there was William, he didn’t seem like your average 14 year old boy but he was sweet and what he did for Kasienka was awesome, especially with the Castle thing! The character with the most poisonous personality had to be Clair though… I can’t believe someone could be some awful just because of a boy, especially to someone who is new to the school and has no idea about the existing relationships! I thought she was horrible and just wanted Kasienka to stick up for herself the whole way through. I think this book was brilliant and really can teach kids a thing or two about their actions, how they respond to others’ actions ad how both of these things can affect their own happiness. I think many verse novels get brilliant points across in a short space and this one is definitely like that. Many reluctant readers may be swayed by this story because of how quick and easy it is to read! 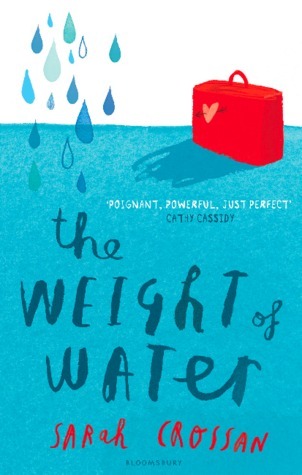 The Weight of Water is Sarah Crossan’s debut novel. It is published by Bloomsbury on January 5th. My copy was an ARC so the above quote may differ slightly to the printed text. Thank you to Bloomsbury for sending me this book in exchange for an honest review. Great review – thanks! I love verse novels too and I’ll look out for this one. I am a real sucker for novels in verse so I can’t wait to read this one too. Fabulous review honey, and I hope you had a good New Year. I still haven’t read a novel in verse, I have no idea whether they’re for me or not so I never get round to trying one. The plot of this does sound really interesting though. Oooh! I do SO love a novel in verse! When done well, they are some of my ALL time favorites! This is the first I’ve heard of this one, but I’ll definitely have to try and look it up!